You’ll receive: 1 vector ai + eps10 – pack of 17 watercolor yoga postures. 17 jpg and 17 png files – high resolution image (6000×6000, 300 dpi). 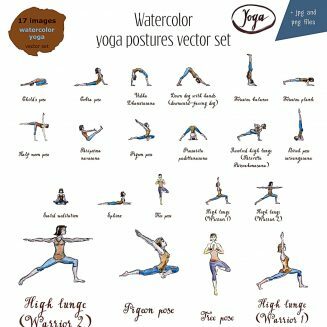 Child’s pose, Cobra pose, Urdha Dhanurasana, Down dog with hands, Forearm balance, Forearm plank, Half moon pose, Paripurna navasana, Pigeon pose, Prasarita padottanasana, Revolved high lunge (Parivrtta Parsvakonasana), Birch pose Sarvangasana, Seated meditation, Sphinx, Tree pose, High lunge (Warrior 1), High lunge (Warrior 2). File format: .png, .ai, .eps for Photoshop or other software. Tags: asana, gym, lifestyle, plank, pose, postufre, relax, sport, watercolor, watercolor illustration, yoga.